Cloud Climbing Beauty: What is a Serum? The word "serum" means different things depending on whether you are talking about medicine or skin care. Since I don't talk about medicine on this blog, we shall discuss the word serum as it relates to skin care. So, what is a serum and why would you need one? A facial serum can give your skin moisture, but it is not just a moisturizer. It is a nutrient rich liquid or liqui-gel that has smaller molecules than a moisturizer, thereby allowing it to get nutrients deep into underlying layers of your skin that cannot be reached by a regular moisturizer. Some customers will find that a facial serum will give their skin enough moisture and they do not need an added moisturizer, while others will like using both. If you are using a serum, you apply it after cleansing your face and before applying moisturizer. If you want to use both a serum and moisturizer but do not want a heavy application and are concerned about using it under makeup, try using the serum at night. You might even alternate nights - using the serum one night and your moisturizer the next. 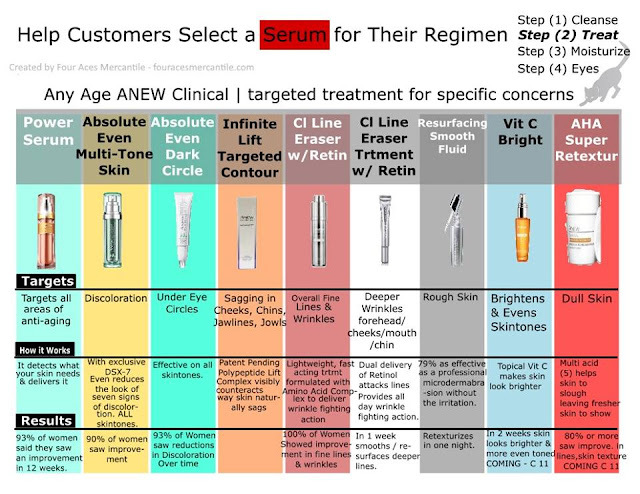 Here is a chart created by a fellow Avon Rep. showing the serums and other treatment products that Avon offers and their benefits. (Treatments are also used after cleansing and before moisturizing.) You can find all these products in my eStore. Do you like what you see here? Do you think your friends/coworkers/acquaintances would like these products as well? Would you like to get these products at a discount while making extra income? Talk to me about becoming an Avon Representative and receiving top quality training on skin care so that you can recommend these products to your own customers! Training is done online at your own pace and in your own home, and it's a free benefit for all Avon representatives who chose to take advantage of it.